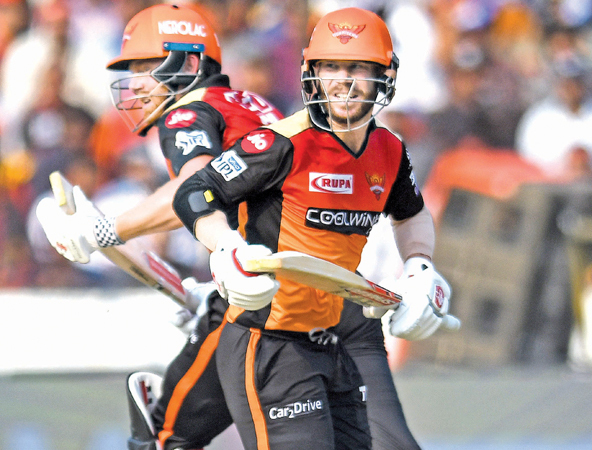 HYDERABAD, Sunday - Australia’s David Warner hit an unbeaten 100 and put on a record stand with Sunrisers Hyderabad teammate Jonny Bairstow in the Indian Premier League on Sunday to boost his return from a ball-tampering scandal. Warner has been in top form on his comeback to the Twenty20 tournament after missing the previous edition along with Steve Smith over the tampering row. The left-handed batsman put together IPL’s best ever opening stand of 185 with Bairstow to set up Hyderabad’s 118-run win over Royal Challengers Bangalore. “I think the 12 months have done me well -- I think I am refreshed,” Warner, whose year-long ban from state and international cricket ended on March 28, said after his 55-ball blitz. Hyderabad posted 231 for two after being put in to bat first and then bowled out Virat Kohli’s Bangalore for 113 in 19.5 overs. The batting duo’s partnership surpassed the previous best of 184 between Gautam Gambhir and Chris Lynn for Kolkata Knight Riders in 2017. It was hugs and celebratory air punches for the Aussie-English duo in an Ashes year as Bairstow reached his maiden IPL hundred in 52 balls. Bairstow was out to spinner Yuzvendra Chahal for 114, his 56-ball knock laced with 12 fours and seven sixes to be named the man of the match. But Warner continued to pulverise the Bangalore bowlers and climbed to the top of the IPL batting chart with 254 runs in three games. Bairstow is second with 198 runs. Warner fired 85 off 53 balls on his IPL return last Sunday and made 69 in his team’s previous win. Warner and Smith, who is playing for Rajasthan Royals, are keen to prove their worth in the IPL, ahead of the 50-over World Cup starting in May. The suspension did not include club games but IPL’s governing council decided not to allow the disgraced duo in the 11th edition last year.